Sophomore guard Josh Fink looks to pass to senior forward Chad Kaiser in Coppell's Feb. 7. matchup against Hebron at Coppell High School. The Cowboys will play their bi-district playoff game against Euless Trinity on Tuesday at Southlake Carroll High School at 7:30 p.m. Photo by Regan Sullivan. Sophomore guard Josh Fink looks to pass to senior forward Chad Kaiser in Coppell’s Feb. 7. matchup against Hebron at Coppell High School. The Cowboys will play their bi-district playoff game against Euless Trinity on Tuesday at Southlake Carroll High School at 7:30 p.m. Photo by Regan Sullivan. Standing as tall as Mount Everest on the court, Euless Trinity senior Myles Turner is a demanding presence for the Trojans. The seven-foot shot blocker, who is ranked currently as the No. 2 high school prospect in the nation by recruiting services nationwide, will be the focus on Tuesday night as the Cowboys battle the Trojans in the bi-district round of the UIL Class 5A playoffs. Coppell (21-12) and Trinity (24-4) tip off at 7:30 p.m. at Southlake Carroll High School. The Cowboys look to continue their long history of playoff success, reaching the postseason for the 18th time in 19 seasons. 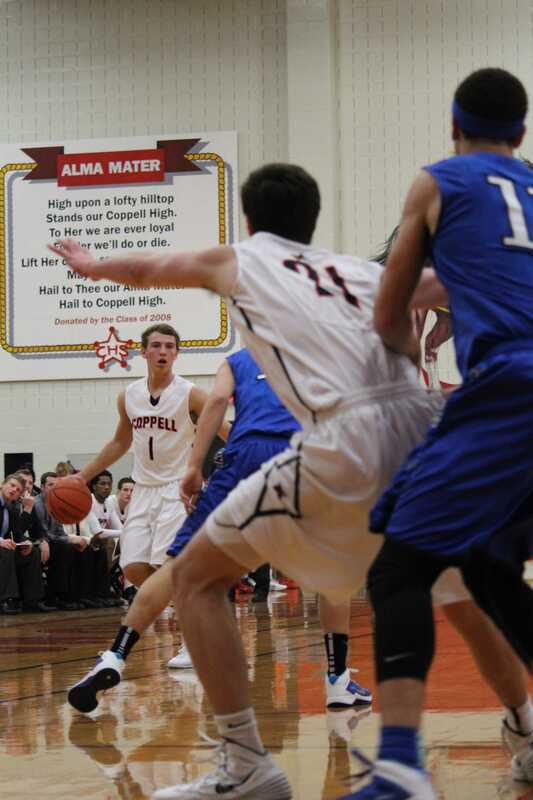 This is also the 15th straight season in which Coppell has appeared in a basketball playoff game. The undecided senior can find a way to put the ball in the basket. Turner, a McDonald’s High School All-American, averages 17.8 points per game, with an shooting repertoire that includes slick post moves, a sweet midrange jump shot and NBA range from beyond the arc. In regards as to how the Cowboys plan to stay competitive on Tuesday, Pehl preached the fact that everyone needs to be involved in scoring.